Product Testing and Development to ensure Winning Performance from every BTS Product! Connery Ends 2011 F2000 Season with 6 Race Wins & "Rookie of the Year"
Watkins Glen, NY � Kyle Connery took his sixth win of 2011, and second of the day, to end the F2000 Championship Series season with a daring move on 2011 Champion Remy Audette on a restart in round 14. Connery would run away from the pack, although the race did end under caution. Connery's sweep of Watkins Glen vaulted him to third in points, winning Rookie of the Year for CC Autosports. Congratulations Kyle and the Team !!!! Jan. 2011 - BTS is proud to announce our new association with the C. C. Autosport F-2000 team for 2011. Driver Kyle Connery, a former 125 cc Shifter Cart Champion has already enjoyed early success in his first season of competition in the Formula Continental open-wheeled class. Kyle started his move up from carts with a string of podium finishes in his first few weeks in the car. His first Win came at the world famous Sebring International Raceway sports car course, with other events at several famous tracks including Homestead-Miami Speedway. Kyle quickly established himself in the F2000 series as he began his Rookie Year after the start of the season. He won 4 races in the hotly contested series and several Fastest Lap records and Pole Positions. A couple of crashes and problems prevented a chance for a couple of more wins. The C. C. AUTOSPORT team is sponsored by Connery Concrete, famous for both decorative and structural concrete work. They just finished a major renovation of the World Famous walkways of Worth Avenue in Palm Beach, Florida! Timmy Megenbier named USF2000 Hard Charger of the Year for 2011. BTS is proud to announce our association with Timmy Megenbier, the 2009 VW TDI Jetta Cup Champion with his new USF2000 Mazda "Road To Indy" effort. Timmy dominated the series in winning the VW Championship in 2009 with the Most Poles, Most Laps Led, and the Most Wins. As the US VW Champion, Timmy moved to Hanover, Germany where he was sponsored by VW and participated in the 2010 VW Scirocco Cup, which is a support series for the famed German (DTM) Touring Car Series. 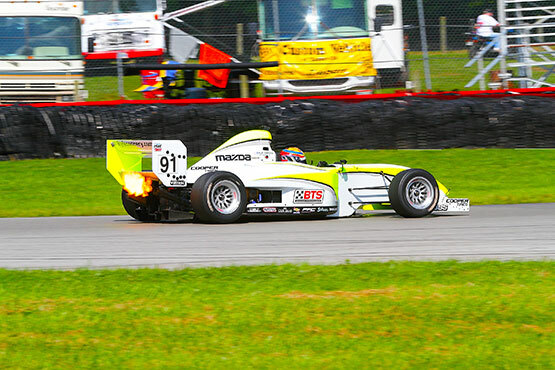 Upon returning from Germany, Timmy quickly organized his USF2000 team and ran a limited schedule for the 2011 season. Timmy had several Top 5 finishes, earned 5 "Hard Charger" Awards and was named the "Hard Charger of the Year" at the year end banquet. We look forward to working with Timmy and his Team in 2012 to continue our efforts to make " the Best " products. BTS is proud to continue it's relationship with the Performance Tech Motorsports in 2011 as part of the company's continued efforts to test and develop BTS products in the most demanding environments to ensure BTS "Winning Performance!" The Performance Tech team placed 3rd in the new LMPC class at last years 2010 Sebring 12 Hour Endurance Race. Brent O Neill, Performance Tech Team Owner, returning to Sebring in 2011, starting the season with a brand new ORECA LMPC car. The LMPC Team struggled with several problems in the 12 Hour Endurance Race, finishing 5th after a true "Endurance" effort. The second race of the season at Long Beach CA. resulted in a major crash and chassis design questions as driver Anthony Nicolosi had a front suspension part pierce his leg. The remainder of the season became a development effort, preparing for the 2012 season. Go to the Performance Tech site for more information and results of the teams IMSALite cars.